The goal of the Shinnecock Bay Restoration Program is to use science, outreach and partnerships to restore the water quality and fisheries of Shinnecock Bay. The bay is the eastern-most lagoon along New York’s South Shore Estuary system. Its aquatic environment — 9,000 acres of open water, salt marshes and intertidal flats — forms a regionally significant habitat for fish shellfish, and waterfowl. 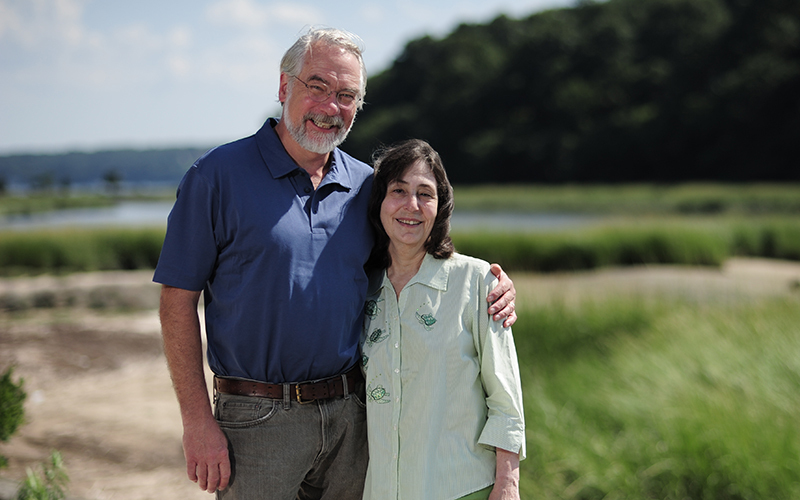 Laurie Landeau of Northport, an aquatic animal veterinarian, and her husband, Bob Maze, a PhD in ecological parasitology, became aware of the restoration project in Shinnecock Bay when they came to Stony Brook Southampton as invited faculty to offer a four-week “AQUAVET” course (Introduction to Aquatic Veterinary Medicine). It was there that they learned of the unique opportunity to impact the marine estuary environment guided by the research and work of prolific marine scientist Christopher Gobler and his team of Marine Science faculty, post docs, graduate students and undergraduates. Landeau and Maze also operate Marinetics on the Eastern Shore of Maryland, which raises oysters in rafts on the surface of the Choptank River. Over-harvesting and degradation of the Chesapeake’s ecosystem had virtually wiped out the wild oyster population there. Marinetics began as a commercial aquaculture company with a mission to produce a high quality oyster that is healthier for the consumer, while also helping to improve the health of the Chesapeake Bay. Now operating as The Choptank Oyster Company, it has grown into a thriving oyster farm that produces an average of 1 to 2 million oysters per year.